Butter Blu-ray Review Despite not reaching its potential, Butter is an enjoyable satirical jab at Midwestern culture that carries itself with enough aplomb that one is willing to overlook its shortcomings. A biting black comedy set in the bizarrely competitive world of butter carving, Butter boasts an ensemble cast and a quirky concept that usually equates to indie success. So, is Butter an artery hardening banquet of full-fat goodness or is it more akin to that Copha stuff your crazy aunt insists on putting on your sandwiches? The Picklers, played by Modern Family’s Ty Burrell and a brilliantly on-form Jennifer Garner, appear to be your archetypical American couple, spending their time swanning around town and basking in the adulation that comes with Bob Pickler being the town’s reigning butter carving champion. From a young age Bob had had a natural affinity for carving elaborate sculptures out of simple blocks of butter, a talent he’d managed to parlay into a fully fledged career; however, this year competition officials have asked Bob to step down and relinquish his title to allow someone else the chance to shine. Bob doesn’t seem too perturbed by this request and agrees, much to the chagrin of wife Laura. Outwardly amicable and professional, Laura is in reality a seething mass of neurosis and maliciousness; fearing that her social standing as Queen Bee of the town will be compromised if a Pickler is no longer the butter carving champion, Laura endeavours to enter the competition and claim the title for herself - by any means necessary. She soon finds herself locking horns with foster child Destiny (Yara Shahidi), a butter carving prodigy, and Brooke (Olivia Wilde), a stripper with whom Bob enjoyed some carnal pleasures and is now being extorted by; as the competition becomes more and more fierce, Laura finds herself resorting to drastic lengths to ensure that first prize ribbon is hers. 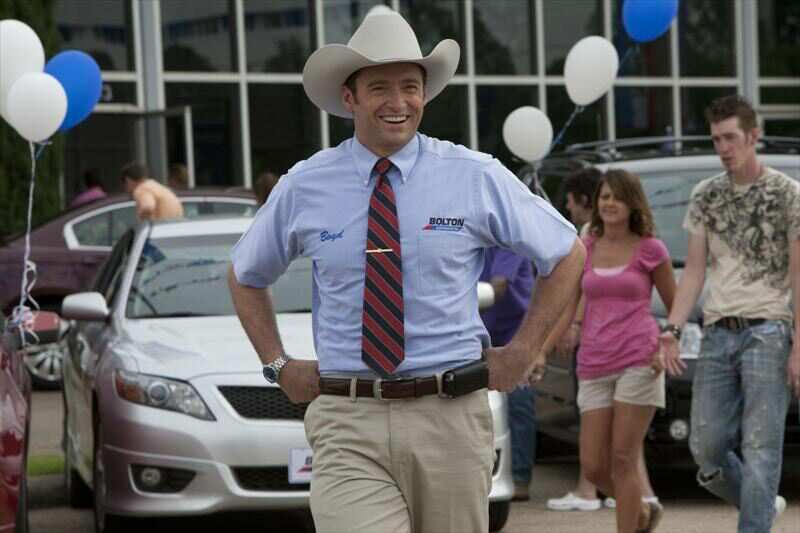 Rounding out the cast are Alicia Silverstone, Kristen Schaal and Rob Corddry in supporting roles. Butter is a black comedy with many familiar themes that belie the esoteric central premise of the film. Unfortunately, it doesn’t quite reach its potential. Despite a glowing ensemble cast (Of which Hugh Jackman was my favourite), Butter seems unsure of where it wants to go with its story. The deliciously manipulative Laura Pickle makes for a great antagonist but the role of Destiny lacks quite a bit of development. Despite being the primary protagonist, her scenes were thinly sketched and seemed only to serve as a counterpoint for the caricature of evil that is Laura. This makes identifying with the character nearly impossible, shifting the focus and tone of the film. It almost seems like we should root for Destiny only because she represents “good”, not because of any emotional attachment to the character. Other sub-plots peter out without resolution, and even the main story arc is meandering. 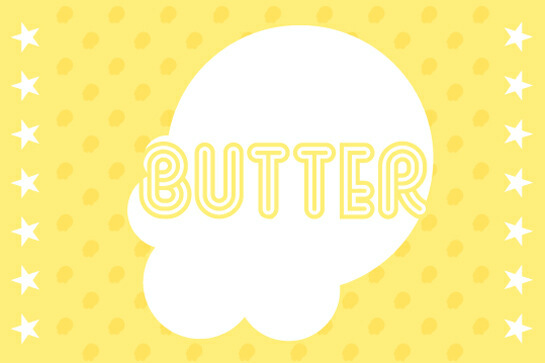 Butter relies on its smug quirkiness at the expense of strong characterisation and, as mentioned before, certain aspects of the story seemed perfunctory or even superfluous. Butter has a nice, clean image with natural textures and fine detail resplendent in their splendour. A light grain settles over the image and there are no overt signs of aliasing or artefacts. The colour palette is incredibly natural and defined and levels remain consistent throughout. Audio is presented with a robust (And now almost customary) DTS-HD Master Audio 5.1 lossless soundtrack. Ambient sounds and musical cues are handled well, and the dialogue, this film’s bread and butter, is crisp and clearly delineated. Overall an impressive transfer, Butter ticks off all of the boxes. 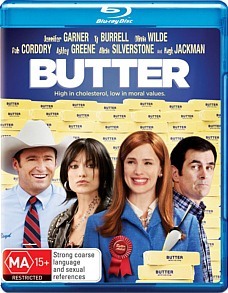 Containing only a brief gag reel and a selection of deleted scenes, Butter is a little light in regards to extras. The deleted scenes are amusing enough, but for the most part it’s obvious why they were excised. Strangely, the Blu-Ray’s running time is 3 minutes longer than the DVD release, despite no mention being made of an extended version. Despite not reaching its potential, Butter is an enjoyable satirical jab at Midwestern culture that carries itself with enough aplomb that one is willing to overlook its shortcomings. Any fears that the central conceit behind the film would be impenetrable to those unfamiliar with the world of butter carving are assuaged within the first ten minutes as the films settles into the rhythm of skewering social conventions. Slightly disappointing, Butter is still worth at least a rental.